A hilarious evening of SNAIL RACING raises over £1000! Rotarians and friends enjoyed a hilarious evening of charity fund-raising at our recent Snail Race. The event was organised by “Fundeo.com” who prepared a special DVD for us to project onto a screen in Kearns Hall. Each race had eight cartoon snails and people had kindly sponsored each race and each snail with cash donations. The sponsors chose their own names for each snail. 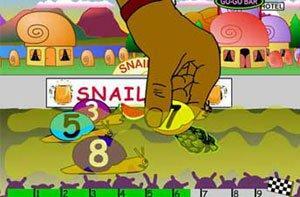 Before each race the “punters” had an opportunity to place their bets on which snail they thought would win and the everyone was ready for “the off”. As the snails raced up the track, some suffered terribly as crows came down and gobbled them up, farmers grabbed them or squashed them under foot. By the end of a race only a few had survived and any who had broken the rules (e.g. by sprouting wings!) were disqualified! Eventually the winner of each race was declared and punters were able to collect their winnings, sometimes with odds as good as 6 -1. After the first four races, a delicious fish & chip supper was delivered by the “Seabells” restaurant and everyone then enjoyed a choc ice. This was a hilarious way to raise over £1000 for local charities and the money will be used to support local projects like the allotment renovation scheduled for next weekend when Rotarians will clear the grass and weeds and build raised beds in the allotment in Windmill Gardens, Margate which is administered by the Kent Community Day Care Scheme for disadvantaged people.